From strong family roots, our business philosophy and vision have blossomed. Founded over 25 years ago by Robert Burlingame, Eagle began operations in the fall of 1989 with one high-pressure concrete tile extrusion machine. Today, Eagle’s Rialto, California facility is the largest in North America. In addition to Rialto, we operate facilities in Phoenix, Arizona, as well as Stockton, California and Sumterville, Florida meeting the demand for concrete roof tile across the sunbelt states and the rest of the U.S. 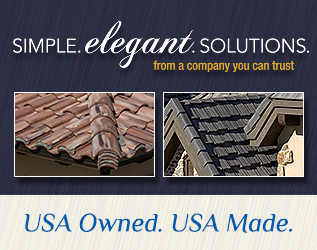 Furthermore, Eagle has grown to eight design centers and a workforce of over 500 employees that are knowledgeable on not only concrete roof tile but regional trends and needs. Our expertise, coupled by our extensive array of profiles and colors, enables us to provide our customers with high quality concrete roofing products that are aesthetically beautiful, durable and environmentally friendly.